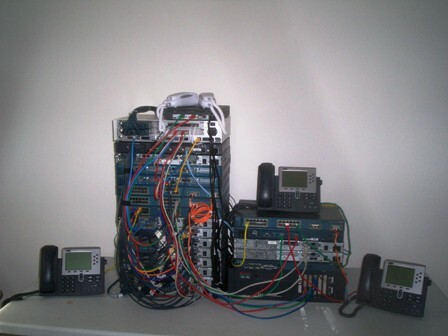 The first question many people will ask is how many routers and switches are required to build a solid CCNA lab? You will generally find that most people will respond with three routers and three switches. Was the number three just pulled out of the air? Heavens no! Three seems to be the magic number so you can have just enough flexibility in the lab to create complex route tables, multiple router paths, switching loops, influence router device elections such as what router will be the designated router, backup router or even ineligible; what switch will be the root bridge, how can we control various root ports, and more. Now if you can only afford two routers are we saying there is no value in getting a smaller lab like that? No way! Any hands on experience is super valuable. By having hands on experience with real Cisco routers and switches will set you apart from anyone interviewing who just are paper CCNAs with no real experience. Now something to keep in mind is that when you are interviewing for a CCNA level position almost everyone will have a CCNA cert. The HR reps will know that is the bare minimum requirement. So then the next step is for you to set yourself apart in the interview process. The manager is going to try to see if you have any actual hands on experience or just book smarts. By having your own lab you be able to speak to things like how do you upgrade the memory on a 1841 router or is the DRAM memory the same between a 2610 and a 2610XM router? If you have a faulty cable(which you never have in Packet Tracer right?) what happens at the protocol or interface level…is there a specific error that might lead you to look for a cable that is not all the way plugged in? What about the WIC-1DSU-T1 module you have. Will it work in your 2610XM and your 1841? Ahhh, that is a tricky question as the WIC-1DSU-T1 will work on the 2610XM but you need a WIC-1DSU-T1 v2 to work on the 1841. So those are some of the things you start to see in your own home lab as one of the major keys is to be able to integrate new items into your network and have them all work together without creating any issues. But that is just where the fun really begins. Having your own home lab gives you the option to throw out that old D-Link router and where you can replace it with one of your Cisco Dual FastEthernet routers. Now you can create access-list and rules to protect your how home network. Then as you start to gain confidence in your abilities in your home lab, you can integrate your other routers and switches and maybe even setup your very own IP phones once you get to CCNA Voice! But I am getting a little ahead of myself. So I think you can start to see all the fun and great experience you can gain by setting up your very own CCNA lab. But let’s swing back to the interview process and how having your own CCNA lab can help you there too. I would like you to look at it from a hiring manager’s perspective. For entry level positions they do not expect the person coming in to have a ton of experience. But they want to make sure they have someone how has initiative and drive. So you can really help to set yourself apart from all the other candidates by demonstrating the real world experience you gained in your lab and pointing out to the hiring manage how passionate you are about becoming a Cisco engineer that you have purchased your own lab as an investment in yourself. You are not content on waiting for others to hand stuff to you, you have the drive and initiative to succeed in today’s workplace. So now that we understand how a CCNA lab will help us really cement the exam concepts into our brain and give us some of the real world experience we need, the next step is to determine exactly what routers and switch we need. So for an in-depth look at the pros and cons and additional building blocks of a CCNA lab, you can visit this article CCENT & CCNA Lab Tips by CertificationKits . But let’s take a quick look at a few basics first. We will not cover every model as the list would be exhaustive, but we will cover the most common models. The 2500 series of routers is ok for those on a budget. They will only support up to 12.3 IOS and the Ethernet routers in that series is only 10mb so they can’t support inter-vlan routing. So this router is generally only for those that are tight on their budget. But if the routers are maxed out at 16/16 they can support IPv6. The 2600 series breaks into two groups; standard and XM models. With either you need a minimum of 64/16 memory to support IPv6. I will try to do a quick synopsis of each model. The XM series will support IOS 12.4 whereas the non-XM series only supports up to IOS 12.3. The 2800 series and the 1841 are great dual FastEthernet routers that are ISR routers that support 12.4. But again, there is much more detailed information in the CCNA Lab Tips above as otherwise it would make this post really long. Now let’s take a look at some basic switches. The 2950 switches are a good layer 2 switch. You are basically looking at two version. Ones that run the Standard Image and the ones that run the Enhanced Image. The normal 2950 generally runs Standard Image. The advantage of the Enhanced Image is a few extra commands are supported that you will see on the exam. Thus look for the 2950C/G/T units as they support the EI IOS. The 2960 is comparable to the 2950 as a layer 2 switch. Then the 3550 and 3560 are layer 3 switches that can also route! A really neat concept. So again, for more information on each, checkout the link above for the CCNA Lap Tips! Great job on posting this. Really helped on choosing the right gears. This is very Good labs practice for beginners like us ….